Wouldn’t it be fascinating to visit all places associated with Jan Karski in Warsaw in an hour or two? Places such as the Church of the Holy Cross, where Karski had a clandestine meeting with his brother, which directly led to Karski’s joining the Polish Underground? 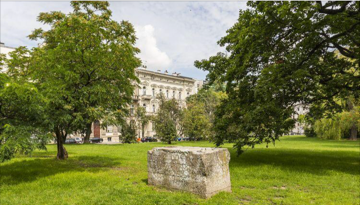 Or the Museum of the History of Polish Jews, where one of the worldwide Karski benches reminds people about his heroic mission to bring his eye-witness report about the Holocaust to the world leaders? 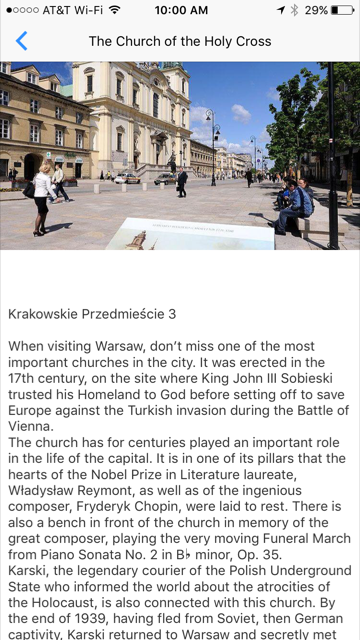 Now you can, thanks to a free “WarsawTour” app launched by the Warsaw Tourist Office, a department of the adminstration of the City of Warsaw. The app is available in English and Polish. Other locations connected to the emissary that we would recommend include: remnants of the Brühl Palace, where the Ministry of Foreign Affairs had its headquarters and where Karski’s diplomatic career was launched right before WWII; 6 Czerwonego Krzyża St., where Karski prepared his reports for Home Army’s Information and Propaganda Bureau; and Jan Karski’s stone and tree in the Garden of the Righteous. This app was created to enhance the experience of visiting the capital of Poland according to your interests and depending on the time you can spend on sightseeing. Maps and photos make it easier to find and enjoy the most interesting and cherished attractions, and detailed descriptions serve as a guide to help the visitors learn interesting facts about each place. Besides Karski, other notable Poles such as Fryderyk Chopin, Maria Skłodowska-Curie and John Paul II have their own tab in the app, too. 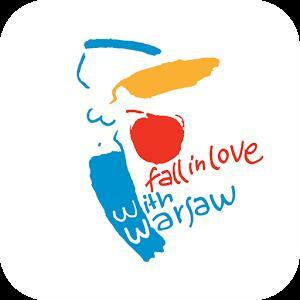 So, next time you visit Warsaw, make sure you have this app on your smartphone. If such a trip is far in the making, go there now and take a virtual trip in the footsteps of Poland’s distinguished historic figures. In the Apple App Store or Google Play, put “WarsawTour” in the search box. In a browser search box, type app.warsawtour.pl. The application was developed by the Warsaw Tourist Office, which runs Warsaw's official tourism website. The text for the “Jan Karski’s Warsaw” section was created in collaboration with Fundacja Edukacyjna Jana Karskiego, JKEF’s sister organization in Warsaw, which presented the app at the “Karski for Leaders” meeting on August 31. During the meeting, the winners of the scholarship funded annually by the Jan Karski Educational Foundation to participate in the 2017 Georgetown Leadership Seminar were introduced. See related story here.